Republican nominee Mitt Romney’s supposed “gaffes” all follow a similar pattern: they are factually true statements that the mainstream media collectively decide he should not have said. Sometimes they have a point: it was not necessary to criticize Britain on the eve of the Olympics in July, or to appear to write off the prospect of winning votes from those who depend on government assistance in May. At other times, however, the media are simply punishing Romney for doing what a leader ought to do. For example, the hubbub around Romney’s strongly-worded statement criticizing President Barack Obama’s response to the embassy attacks reveals that our national press corps is so used to Obama “leading from behind” that it cannot recognize real leadership when it sees it. Romney’s statement was neither too early–24 hours after the first assault on Embassy Cairo–nor too harsh. It was the least Americans could expect. Obama, of course, had other ideas, waiting more than 24 hours to address the attacks directly, and letting his first response–via his campaign–be an attack on his rival, not a defense of American personnel and interests. Obama then jetted off to campaign events and fundraisers, repeating a pattern we have seen so often the past several weeks: Romney and Paul Ryan lead; Obama and Joe Biden follow, imitating or criticizing in their wake. Take another case: Hurricane Isaac. 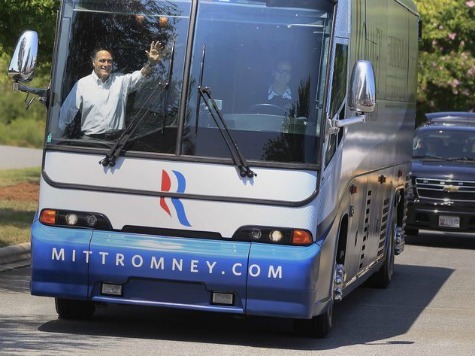 It disrupted the Republican National Convention–but Romney visited victims the day after the proceedings ended, while Obama was out fundraising as usual. Obama only visited three days later, changing his schedule to do so. Then there was the Chicago teachers’ strike, where Ryan made it clear that he and Romney stand with the mayor and the children. Obama’s stance? No one knows. Romney’s approach is not without its drawbacks. Being first means that you are the first to face scrutiny, as Romney–and only Romney, absurdly–did after his response to the 9/11 violence. But that is the price of leadership. It is a price that Obama has been very reluctant to pay. Bob Woodward’s new book, The Price of Politics, makes that clear–especially with regard to the debt negotiations, where Obama failed to compromise. The result of Obama’s finger-in-the-wind style–he stalled on the surge in Afghanistan, and is even reported to have refused to authorize the mission to kill Osama bin Laden three times–is downgraded American credit, diminished American power, and deeper American self-doubt. Romney and Ryan offer a clean break. They lead from the front–which is precisely what Americans want, and what the media do not understand.